The Drive Sober or Get Pulled Over campaign, which begins statewide on August 18 and ends September 5, is carried out with assistance from local law enforcement. Annual campaign running from August 18 to September 5. Photo by: NYS DMV, via Flickr. 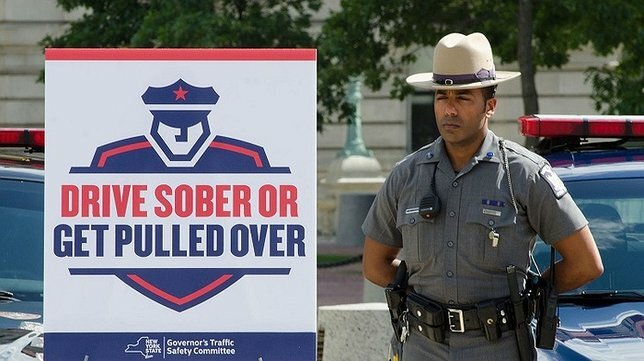 Albany, NY - August 18, 2016 - Today, Governor Cuomo directed New York State Police to ramp up enforcement efforts as part of a national crackdown on impaired driving through Labor Day weekend, one of the deadliest times of year for drunk and drugged driving fatalities. The Drive Sober or Get Pulled Over campaign, which begins statewide on August 18 and ends September 5, is carried out with assistance from local law enforcement. It is coordinated by the New York State Governor’s Traffic Safety Committee (GTSC) and aims to reduce deaths and injuries caused by motorists driving drunk or impaired by drugs. The GTSC and its partners held a press conference in Albany to kick off this year’s effort. Preliminary data from the Institute for Traffic Safety Management and Research (ITSMR) shows that in 2015, alcohol involvement was listed as a contributing factor in more than 7,000 police-reported crashes statewide, while illegal drugs contributed to more than 800 crashes. Drivers convicted of DWI or DWAI three or more times in 15 years face a Class D felony charge, up to seven years in prison, and a fine up to $10,000. More information can be found via Governor Cuomo’s press release. Subject: LongIsland.com - Your Name sent you Article details of "Governor Cuomo Directs State Police to Increase Enforcement for "Drive Sober or Get Pulled Over" Crackdown on Drunk and Impaired Driving"